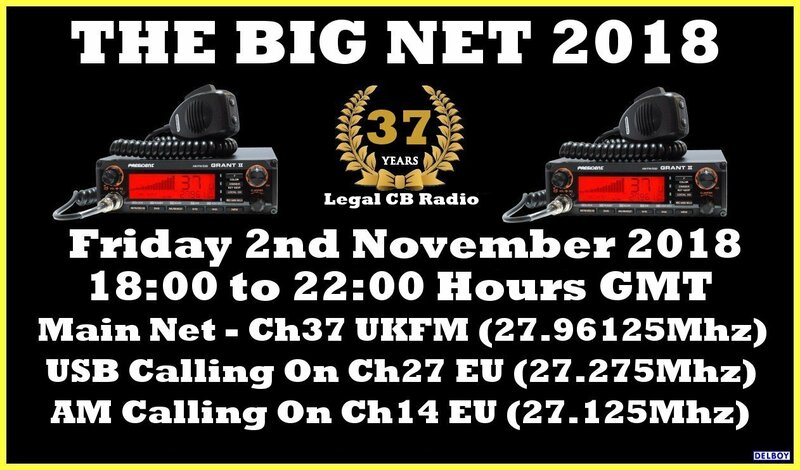 Just a quick reminder that on 2nd November the UK will celebrate 37 years of legal CB radio. The main net will be on channel 37 UKFM (27.96125MHz), of course if it gets busy in your area you can QSY up or down a couple of channels. What's happening around the north east? Will anyone be actually on? Woooo...my Fidelity Homebase's 37th birthday too then! Must bake a cake. Well I certainly will be along with the locals. We shall be moving down one channel from 38 for the night. I'm in, but I suspect as the short-skip is mostly active in daylight hours, even narrowband digital might have difficulties passing through. Nevertheless, I'll be trying on 27.245 in JS8. Tony 26TM034 might be active at that time, so hopefully he'd be so kind to relay at least one message to CH37. One more thing - do you plan to stream it to Zello? Regretfully it is on a Friday night and that clashes with my lads club otherwise I would be more than happy to participate. I hope those of you participating have a great evening . Brilliant night up here in the North East. Channel 37 was chocka block with stations and several nets appeared on other channels. I ended up on the mid band, on ssb. Best night on the radio in years.